As we all know, Jackie Robinson made his Major League debut on April 15, 1947, an event that is celebrated each year on that date with every player on every club wearing No. 42. But three days later is another important anniversary in Robinson’s — and baseball’s — history. On April 18, 1946, he made his debut in organized baseball when his Montreal Royals opened their International League season at Roosevelt Stadium against the Jersey City Giants. Robinson went 4-for-5 that day with a three-run homer. He scored four times, drove in four runs and stole two bases. When he crossed the plate after his home run, teammate George Shuba greeted him with a handshake, a moment immortalized in an AP photo that apparently still hangs in a Capital One Bank branch in Stadium Plaza, a shopping center on N.J. Route 440 adjacent to where Roosevelt Stadium used to stand. The ballpark was torn down in the 1980s, a few years after getting one more minor league go-round in 1978-79 with the Jersey City Indians and A’s. It had also been used for concerts and football games, but its most noteworthy and historical moment was Robinson’s debut. 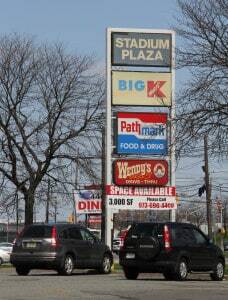 Now, the only indication that Roosevelt Stadium used to sit on Droyer’s Point is that photo in the bank, the name of the shopping center (built in the early ’80s, as best I can tell) and another one of its tenants, Stadium Pizza. On the 69th anniversary of that season-opening Royals-Giants game, I took a drive out to Jersey City. 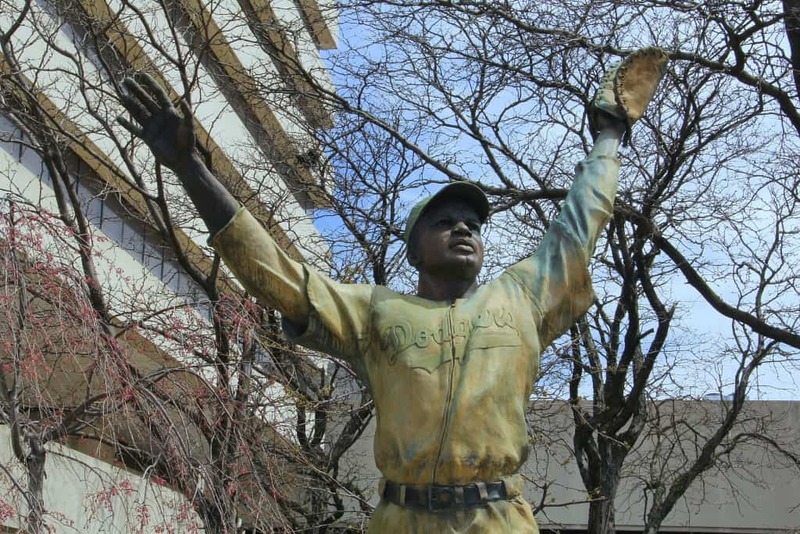 The first stop was Journal Square, where in 1998, a statue of Robinson was unveiled to mark Jersey City’s place in baseball history. The larger-than-live likeness shows Jackie in his Dodgers uniform, with the familiar No. 42 on the back, rather than in a Montreal jersey with No. 9, which he wore during his season in the minors. Though the statue is meant to commemorate his minor league appearance at Roosevelt Stadium, it’s not entirely inaccurate — the Dodgers played 15 games in Jersey City across the 1956 and ’57 seasons, with Jackie donning that No. 42 uniform. From Journal Square, which I had seen before, I drove about three and a half miles out to Droyer’s Point to see for myself what had become of the Roosevelt Stadium site. It was no mystery — in looking at Google Maps and reading other sources, I knew that a condo and apartment complex called Society Hill was built where the stadium had been, that Stadium Plaza was next door and that the Thomas M. Gerrity Athletic Complex sits adjacent to Society Hill along the Newark Bay waterfront. Stadium Plaza and Pizza are nothing special (at least from the outside; I did not partake of the pizza on this trip), a 1980s New Jersey strip mall that, from the looks of things, hasn’t been updated since. Society Hill is a private, gated community with a guard house. The only way in is to live there or be invited in. From the website, it also appears that they handle all real estate sales with their own in-house agents, so finding an open house wasn’t going to be an option — it appears my wife and I would have to make an appointment to look at an available unit just to get inside the gates. I parked in a corner of the shopping center’s lot near the Society Hill entrance and walked over for some photos. 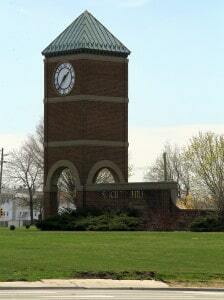 A large clock tower marks the entrance, not far from the spot of a circular plaza that sat beyond the center-field scoreboard, which itself had a clock atop it. The guard house sits near the site of that plaza beyond center field. Inside, Society Hill’s streets are all named for trees, with a grid of parallel blocks over the site of the field and grandstand. To the north, where Roosevelt Stadium’s parking lot used to be, a less-uniform layout of streets continues with the tree theme. But north of that, on a section undeveloped during Roosevelt’s time, another neighorhood features a main road called Robinson Dr. While the placement may be off — it’s not on the actual stadium site — the sentiment is a nice gesture, even if the general public can’t acknowledge it. In walking over to the site, I made another nice discovery. I noticed cars in the parking lot of the Gerrity complex and heard the sounds of fans cheering on a game. I walked further and found the New Jersey City University baseball team taking on Rutgers-Camden. I climbed the stands of the football field for a few shots of the action from a higher vantage point. Out beyond left field, over the trees, the balconies of Society Hill’s units gazed back. I wondered if any of the players on the field knew of the history that happened on a ballfield a few hundred yards from where they played. If you stand on first base and break for second, then alter your path a few degrees to the right of the bag and keep going, you’ll continue into left-center. After you leap the temporary white-plastic outfield fence and soar over a tree-lined ravine onto the Society Hill property, if you could then scale the building in your way and come down on the other side, you’d find yourself at the corner of Cherry St., crossing your path, and Dogwood St., continuing in front of you. Following Dogwood to its other end, where it meets Cottonwood St., you’d then be in the general vicinity of Roosevelt Stadium’s home plate. The address is 25 Dogwood St., Jersey City, and in a curb alongside a parking space at the end of the street is a storm drain that, as best as I can match up in comparing Google Earth satellite views and the street overlays on HistoricAerials.com, marks the spot (or very close to it) where George Shuba shook Jackie Robinson’s hand on April 18, 1946. 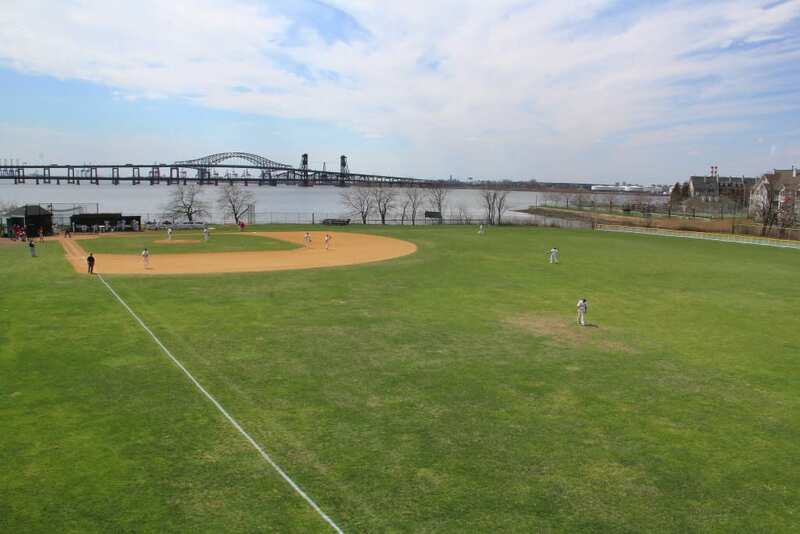 The Thomas M. Gerrity Athletic Complex and Society Hill at Droyer’s Point, former site of Roosevelt Stadium.